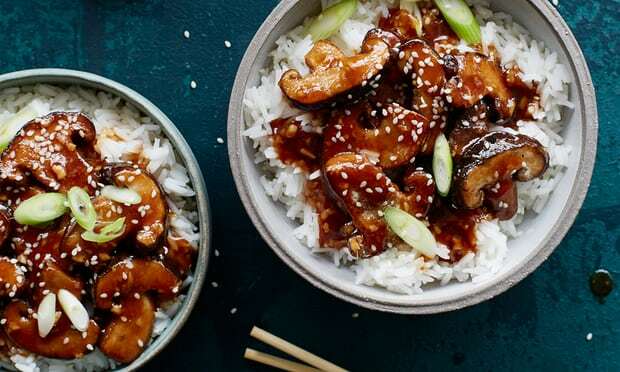 Cooking the mushrooms in cornflour gives them a rich, meaty texture that pairs beautifully with the sweetness of the caramelised ginger and garlic. Tasty and satisfying. 1Put the mushrooms into a bowl, sprinkle two tablespoons of the cornflour over the top and mix together, making sure the mushrooms are well covered. 2Heat the groundnut oil in a wok or pan, add the mushrooms and fry for five or six minutes, until they are cooked through and slightly crisp on the outside. Set aside. 3Mix the remaining cornflour with the water , wipe the wok with kitchen paper and return to the hob on a low heat. 4Pour in the sesame oil, add the chopped ginger and garlic and cook for about a minute to release the aromas. Sprinkle over the sugar and stir until caramelised. 5Increase the heat slighty and add the cornflour mix, soy sauce and rice wine vinegar, stirring until the sauce thickens. Add the mushrooms and simmer for 2 minutes, ensuring they are well covered in the sauce. 6Serve over hot basmati rice, garnished with sliced spring onion and a sprinkling of sesame seeds.